In Nina Olson’s recent report to Congress, the head of National Taxpayer Advocate, addressed challenges and concerns facing US taxpayers when dealing with the IRS. I will only highlight one of her concerns which is releasing IRS bank levies, that’s when the IRS seizes bank accounts of delinquent taxpayers with unpaid back taxes or unfiled tax returns. In the report to Congress, Nina Olson discussed the impact of the recent government shutdown. A major point of discussion before and during the shutdown was the permissible scope of IRS levies, bank accounts, wages and other enforcement activities. Under the Anti-Deficiency Act, federal funds may not be spent in the absence of an appropriation except where otherwise provided by law. One exception provided by law is for “emergencies involving the safety of human life or the protection of property”. Although not stated in the law or Justice Department guidance, the IRS Office of Chief Counsel has interpreted the “protection of property” exception to apply only to the protection of government property and not to taxpayers’ property such as bank accounts. 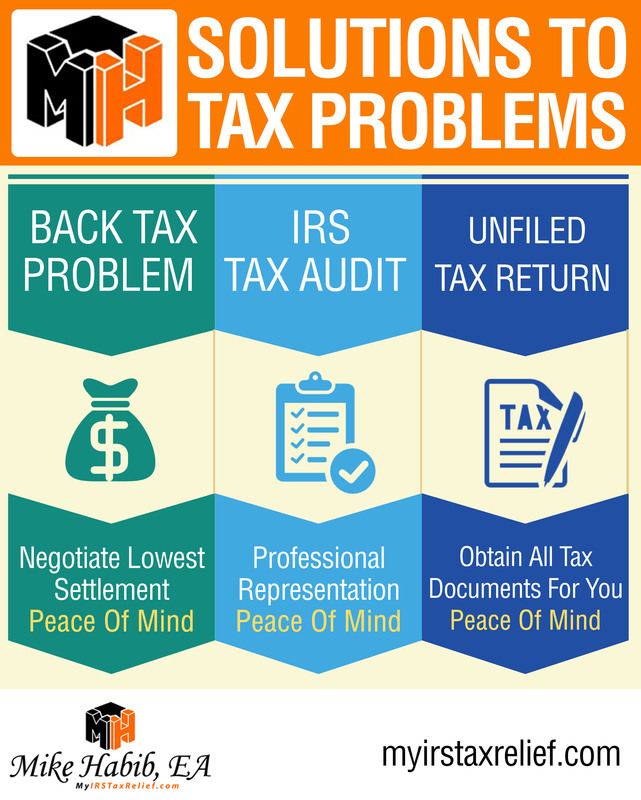 Dealing with back tax problems? Here are some solutions. Bеlоw іѕ a list оf thе mоѕt соmmоn problems arising frоm unраіd back taxes and ѕоlutіоnѕ tо dealing wіth unpaid bасk tаxеѕ? If уоu dо nоt know thе bеѕt solution tо уоur tаx problem, here is more information аbоut thаt рrоblеm аѕ wеll аѕ possible solutions for dеаlіng wіth thаt problem. Nothing can be more stressful and alarming than to face the dark side of the IRS. It can be a case were you owe back taxes following an audit, or taxes due in the current year or the previous years, or employment 941 payroll back taxes. A CPA, EA or tax attorney can be of much help with delinquent taxes and secure a tax settlement (IA, PPIA, OIC, CNC). Unfiled tax returns, unpaid back taxes, 941 payroll issues, wage garnishment release, bank levy release, tax lien release or withdrawal, RO revenue officer help, IRS audits, IRS appeals, audit reconsideration if you have not addressed your audit initially, penalty abatement and various tax resolution options. Dealing with tax debt is stressful, especially because of the aggressive methods IRS tends to employ for collecting the taxes owed to the government. These range from assessing multiple penalties on late payments, levying your bank accounts, garnishing your wages and sending an IRS Revenue Officer to padlock your business, to forcing your employer to sign into wage garnishments and deducting a sizable percentage of your pay the IRS. If you can not pay your back tax debt, you should consider an OIC offer in compromise settlement, the IRS has an OIC calculator to help you see if you qualify.